This book maintains the high quality of the New Studies in Biblical Theology series, of which it is the 18th volume. The cross is prominent in all of the Gospels, but especially in Mark. Even its earlier sections point to the atonement. As Bolt progresses through this Gospel, he takes into account the culture of that day as well as their understanding of the OT to explain various atonement themes. The cross makes possible salvation by faith alone. It reveals God’s merciful plans for the world. It shows that we need not fear tribulation or suffering from the world because Christ has overcome the worst of it. It shows that we need no longer fear the wrath of God. Finally, by introducing characters who stand and watch the crucifixion from a distance, Mark brings us into his narrative as well. We, too, see the cross from a distance, both of space and time, yet in the same world. Yet, from that vantage point, God makes himself known to us in Christ. Very helpful focus on how Mark builds his story to focus on the climax of the cross. Perhaps a bit haphazard in structure, but felt easy to read despite the scholarly nature of his argument. This is a great book. I've often looked at it, and thought: "wow - probably too technical" and have missed out. He walks us through Mark's gospel with some helpful themes, carefully considered, and helpfully explained. I found a lot of wealth in his book which I will draw from when next I preach through Mark. Of particular interest were his thoughts on Mark 13 (the so-called apocalyptic discourse), and how the chapter relates to the cross of Jesus, rather than his return. Not sure I'm on board, but it was a refreshing and well-argued chapter. I'd recommend this book to anyone thinking of preaching Mark, or anyone who is keen to dig a little deeper into that gospel - this is good stuff. This was a good book. Not great, but good. 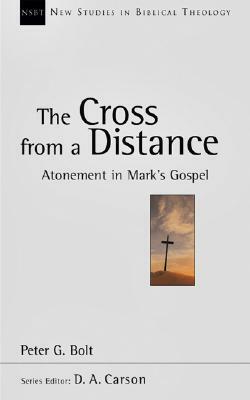 I read this as I was preparing to lead an inductive study in the book of Mark and appreciated this as a resource to think about Atonement theology in and through Mark's gospel. A helpful resource, if a bit focused a little too strongly on atonement theology as substitionary in my mind. Amazing book. Bolt takes you straight into the 1st century mind to understand the cross as they understood it, to see it as they saw it, and be awed by it as they were. Definitely don't agree with everything he says, but I highly recommend this book! A book with an interesting, and somewhat helpful perspective on the Gospel of Mark. Everything in the Gospel points ahead to the cross. Challenging read that elevates the cross as the means by which a "distant God" came near. The section on Mark 13 as a precursor to the passion narrative is worthy of healthy consideration. Peter G. Bolt - Peter G Bolt is the head of New Testament and Greek at Moore College, Sydney. He continues to be fascinated with Jesus, and loves teaching the Gospels. Peter has a PhD from King's College London and has published works on mission, the Gospels, church life, and the afterlife. These interests arise from a great concern to assist people to understand Jesus better, to put their faith in him, and to take their place in Christ's mission as we wait for the coming kingdom.